by Senffner, Daine; Kepler, Leslie G.
As managers, we are expected to hold career and professional development discussions with our employees, although many of us feel ill-equipped for these conversations. 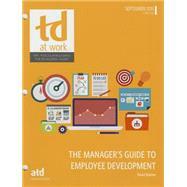 Are you unsure how or where to begin with your employees' development? Perhaps you want to brush up on how to create more meaningful development plans? David Hosmer, EdM, CPLP, has 26 years' experience in organization development, learning and development, and coaching as a manager, director, and consultant across a variety of industries. He is a graduate of the Harvard Graduate School of Education, MIT internal Leader to Leader, and the Harvard Kennedy School's Art and Practice of Leadership Development, and a lifetime associate member of the Career Thought Leaders Consortium. David can be reached at CascadingCoaching.com.